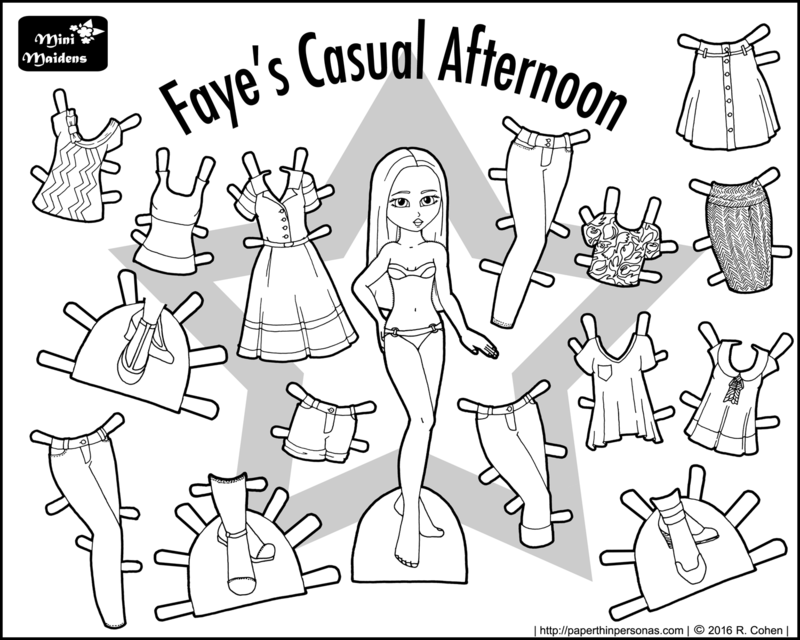 Today, we have a paper doll coloring sheet for Faye of Mini-Maiden fame. One thing I try to do with the contemporary casual style Mini-Maidens is make sure there is some unique pieces to each set, but also that every set could be combined. I mean, think about it, if you put together Greta in Autumn, Meet Faye, Isadora in Ruffles and Bows, Faye’s Fashionable Geometrics, Meet Greta, Hazel’s Geometric Style, Meet Hazel and Hazel’s Fresh Fashions than you would have nine paper dolls and at least 98 pieces of clothing and shoes. I decided not to even count the necklaces and purses and things. The point I am trying to make, all be it maybe obliquely, is that every Mini-Maiden paper doll coloring sheet builds on every other one, allowing a ton of options that are fun. Because all the clothing can be shared among the paper dolls, there really are endless options. Plus, if you’re hosting Easter and you need something to distract some small children, might I recommend printing out a few black and white paper doll sets to color? I swear it works. One friend told me it got her five year olds to be occupied for a whole 30 minutes. Not to brag or anything, but seriously, have you tried to occupy five year olds before? Totally impossible. Anyway, moving back to today’s paper doll and away from the difficulties with occupying small children- I did something I haven’t done in a long time and tried to do a tweed texture on the skirt. I used to do a lot of texture in my black and white sets (here’s a better example of the “tweed texture”) and then I kinda abandoned it, but I’m trying to get back into the practice. I also did a crop top. I might hate them, but they seem to be coming back into style. Though… I mean, I lived through the 90s and I would really rather not have to live through them again fashion-wise. If you want more paper dolls featuring Faye, there are quite a few here. So, Monday there will be some black and white Marisole Monday paper dolls I found in my archives and then I will probably be going on a haitus for the month of April. I need some breathing room right now and I think I should take it. Thoughts? Comments? As always, I love to hear from y’all. I love the Mini Maidens so much! Every time I see one I think, I should color this. Gotta find the time. And I can tell you, paper dolls are great for kids. All of the kids in my life (my two sons and two nieces) love them. It’s amazing to see how differently they play but they seriously play for hours. It’s wonderful!